Note 1850 Her brother George Wills Priston b. Torquay, England, UK was a professional photographer and chemist, whose business Priston and Small manufactured photographic chemicals and dealt in photographic goods between c. 1864 and 5 October 1867, when he and his partner, Thomas Stephen Small formally dissolved their company. From 1864 to 1866 he and Jabez William Small published Photographic News of the Month, considered to be Australia's first photographic magazine. (gives her birthplace as Casely, Lustleigh, Devon). [S1] Registry of Births Deaths and Marriages Pioneer Index Victoria 1836-1888 "#M232." Description: Series 02, Register 1861-1863; Reference Number: M2/7. [S11] Newspaper - Argus 25 Mar 1862, p4. [S185] Property Titles. ; PROV (Public Records Office Victoria), C/T 1069-756; C/T 1340-906; C/T 2550-898 - William Elms died the 25th day of February 1903. On the 29th day of May 1903 probate of the will of the said William Elms was granted to Marie Elms of Moyarra, Widow and Arthur William Elms of Beaver Street Malvern Estate Agent as executrix and executor. Dated the 4th day of June 1914. [S185] Property Titles. ; PROV (Public Records Office Victoria), C/T 1098-551; C/T 1098-552; C/T 1100-860 - William Elms died the 25th day of February 1903. On the 29th day of May 1903 probate of the will of the said William Elms was granted to Marie Elms of Moyarra, Widow and Arthur William Elms of Beaver Street Malvern Estate Agent as executrix and executor. Dated the 4th day of June 1914. [S185] Property Titles. ; PROV (Public Records Office Victoria), C/T 1164-607 - William Elms died the 25th day of February 1903. On the 29th day of May 1903 probate of the will of the said William Elms was granted to Marie Elms of Moyarra, Widow and Arthur William Elms of Beaver Street Malvern Estate Agent as executrix and executor. Dated the 4th day of June 1914. [S185] Property Titles. ; PROV (Public Records Office Victoria), C/T 1164-607 - C/T 3882-330 - Shire of Berwick. [S5] Registry of Births Deaths and Marriages Death Index Victoria 1921-1985 "#D11200 age 84 [par Thomas PRISTON & Sarah HILL]." [S11] Newspaper - Argus 7 Aug 1923 p1. [S185] Property Titles. ; PROV (Public Records Office Victoria), C/T 1098-551; C/T 1098-552; C/T 1100-860 - Arthur William Elms the survivor of the proprietors named herein is now registered as the sole proprietor. [S185] Property Titles. ; PROV (Public Records Office Victoria), C/T 1069-756; C/T 1340-906; C/T 2550-898 - Arthur William Elms the survivor of the proprietors named herein is now registered as the sole proprietor. [S83] Online index to the UK census "Class: HO107; Piece: 229; Book: 11; Civil Parish: Tor Moham; County: Devon; Enumeration District: 5; Folio: 13; Page: 21; Line: 5; GSU roll: 241314." [S83] Online index to the UK census "Class: HO107; Piece: 1874; Folio: 121; Page: 37; GSU roll: 221022." William Elms built "Casely" in Salisbury Road, and owned land in the valley below it. He was on of the five trustees instrumental in building the assembly hall. His daughter Annie married one of Dr Halford's sons. The family later owned properties in Moyarra, Gippsland. Note William had to leave school early to support his mother, brothers and sisters. He went to London and worked with Keane's military tailors. He had access to an uncle's library and was able to improve his education..In 1853 he was sent by Mr Keane to start a business in Melbourne with Keane's son, so he sailed on the Bloomer with his mother Mary and sister Ann departing Liverpool 19 March arriving Melbourne July 4 1853. Sir, With reference to a communication received respecting a selection held by me in the parish of Pakenham, and withdrawing the license on account of non-compliance with the terms required. I beg to say that owing to the impassable state of the roads, it has been impossible to get material for the erection of a suitable dwelling for myself and family on to the ground, during the past winter months, but it is my intention to preceed with the work forthwith, and under these circumstances I hope you will see fit to withdrawing your decision and continue my license. I may add that I have already done a great deal of work to the place, in the way of fencing, clearing, and planting, and also erecting huts and outoffices. Death-Notice* 26 Feb 1903 ELMS.—On the 25th February, passed away peacefully , after a short illness, at Moyarra, South Gippsland, William Elms, J.P., the beloved husband of Marie Elms, aged 78. 18 Jan 1908, WEDNESDAY, JANUARY 20. UPPER BEACONSFIELD. To Be SOLD at the Room, Broken Hill-chambers, 31 Queen-street, Melbourne. At Half-past Two O'clock. In the Estate of the late Mr. W. Elms. On One Block, with Frontage to Main Road, There is a GOOD WEATHERBOARD VILLA RESIDENCE, with Stabling, and all Conveniences. The Other Blocks are Vacant, and Command FINE VIEWS OF THE COUNTRY. Plans can be inspecteed at and all particulars obtained from the Auctioneer's Office. Stephen Daniel Bradshaw added this on 12 Jan 2011. [S81] Land Records, Parish Maps & Council Rate Books. ; PROV (Public Records Office Victoria), Land File 2562/19.20. [S185] Property Titles. ; PROV (Public Records Office Victoria), C/T 1069-756 - William Elms of Melbourne. [S81] Land Records, Parish Maps & Council Rate Books. ; PROV (Public Records Office Victoria), 2562/19 (VPRS626/P0/1580). [S81] Land Records, Parish Maps & Council Rate Books. ; PROV (Public Records Office Victoria), VPRS 5357/P0000/3904 - 1561/49 WILLIAM ELMS PAKENHAM 63 19--1--30. 1877 - 1888. [S185] Property Titles. ; PROV (Public Records Office Victoria), C/T 2550-898 - William Elms of Jumbunna East. [S185] Property Titles. ; PROV (Public Records Office Victoria), C/T 1098-551; C/T 1098-552; C/T 1100-860 - Horatio Kelson to William Elms of Temple Court, Melbourne, Accountant. [S185] Property Titles. ; PROV (Public Records Office Victoria), C/T 1164-607 - Horatio Kelson to William Elms of Temple Court, Melbourne, Accountant. [S11] Newspaper - Argus 26 Feb 1903 p1. [S12] Newspaper - South Bourke and Mornington Journal 20 Jul 1881, p3. [S12] Newspaper - South Bourke and Mornington Journal 10 Aug 1881, p3. [S11] Newspaper - Argus 5 Apr 1882, p12. [S16] Newspaper - The Age 17 Jan 1885, p11. [S11] Newspaper - Argus 18 Jan 1908, p3. Death-Notice* 19 Sep 1946 ELMS.-On September 18, at his home, 4 Hobart road. Murrumbeena, Arthur William, dearly loved husband of Ada Elms, and devoted father of Alfred, George, Edith, and Harry, aged 82 years. (By request, no flowers). [S1] Registry of Births Deaths and Marriages Pioneer Index Victoria 1836-1888 "#B22037." [S11] Newspaper - Argus 31 Oct 1863, p4. [S2] Registry of Births Deaths and Marriages Federation Index Victoria 1889-1901 "#M3984." [S11] Newspaper - Argus 5 Oct 1893, p1. [S185] Property Titles. ; PROV (Public Records Office Victoria), C/T 1069-756; C/T 1340-906; C/T 2550-898 - Arthur William Elms to Carrie Elms and Mary Hester Elms both of 8 Westgarth Street East Malvern Spinsters - proprietors as tenants in common in equal shares - C/T 4879-738. [S185] Property Titles. ; PROV (Public Records Office Victoria), C/T 1098-551; C/T 1098-552; C/T 1100-860 - Arthur William Elms to Carrie Elms and Mary Hester Elms both of 8 Westgarth Street East Malvern Spinsters - proprietors as tenants in common in equal shares - C/T 4879-739. [S11] Newspaper - Argus 19 Sep 1946 p2. [S1] Registry of Births Deaths and Marriages Pioneer Index Victoria 1836-1888 "#B11032." [S11] Newspaper - Argus 23 Mar 1865, p4. [S185] Property Titles. ; PROV (Public Records Office Victoria), C/T 4879-739 - W.R.Hume Proprietary Limited of 114 King Street Melbourne. [S35] Probate Records, PROV (Public Records Office Victoria), VPRS 28/P3, unit 4206; VPRS 7591/P2, unit 1295. [S1] Registry of Births Deaths and Marriages Pioneer Index Victoria 1836-1888 "#B4648." [S11] Newspaper - Argus 23 Dec 1869, p4. [S2] Registry of Births Deaths and Marriages Federation Index Victoria 1889-1901 "#M4907." [S11] Newspaper - Argus 14 Sep 1901, p9. [S11] Newspaper - Argus 11 Sep 1945, p2. [S1] Registry of Births Deaths and Marriages Pioneer Index Victoria 1836-1888 "#B11403." [S11] Newspaper - Argus 2 Feb 1872, p4. [S1] Registry of Births Deaths and Marriages Pioneer Index Victoria 1836-1888 "Reg W chip." [S16] Newspaper - The Age 19 Sep 1896, p3. [S14] Newspaper - Ovens and Murray Advertiser (Beechworth, Vic), 26 Sep 1896, p3. [S1] Registry of Births Deaths and Marriages Pioneer Index Victoria 1836-1888 "#B25380." [S11] Newspaper - Argus 14 Oct 1876, p1. Death-Notice* 28 Nov 1955 ELMS. - On November 27, at her residence, 13 Poplar grove, Carnegie, Florence Annie, beloved wife of the late Frank P. Elms, loving mother of Ruth, Frances, Hubert, and Leslie, loved gran of Robert, Brian, John, Marie, Graham, Judith, and Roger, aged 86 years. [S35] Probate Records, PROV (Public Records Office Victoria), VPRS 28/P4, unit 1131; VPRS 7591/P3, unit 120. [S1] Registry of Births Deaths and Marriages Pioneer Index Victoria 1836-1888 "#B11984." [S11] Newspaper - Argus 28 Apr 1869, p4. [S5] Registry of Births Deaths and Marriages Death Index Victoria 1921-1985 "#D13721 age 86 [par Thomas CROUCH & Emma TURNER] [reg. Murrumbeena]." [S11] Newspaper - Argus 28 Nov 1955, p11. Mary Ann Bonwick married Henry Bayston 1851 Somerset England. Their parents were James Bonwick and Maria Ann Preston (Maria Ann died 25 Sep 1873 in Melbourne, buried with Walter Bonwick and some of his family; James died in 1859/#3641 VIC)." [S14] Newspaper - Married. At Hawthorne Church, on the 15th instant, by the Rev. W. Wood, Mr. Walter Bonwick, to Mary, eldest daughter of Mr. Britton, of Castlemaine. Mount Alexander Mail (Vic. : 1854 - 1917), Fri 25 Jul 1856, p4. [S36] Inward & outward passenger lists to and from Victoria. Series: VPRS 14; 7666; 7667; 7786); PROV (Public Records Office Victoria), James (63) and Mary Ann (62) Bonwick arrived in Melbourne on the Themis on 1 July 1854 with children Caroline (40), Walter (29, Schoolmaster) and Elizabeth (19). [S5] Registry of Births Deaths and Marriages Death Index Victoria 1921-1985 "#D22291 age 90 [par Walter BONWICK & Mary BRITTON]." Mr Goff was the founder of All Saints Grammar School in St Kilda, and built "Harpfields" in St George's Road in 1879. He was on of the five trustees instrumental in building the assembly hall. Land-Note* 12 May 1885 GEM-D-38: All Saints Grammar School, East St Kilda. 12 May 1885. Correspondence No 1094/49. To the Secretary of Lands, Victoria. Sir, In reply to yours of the 7th inst. re improvements on Mr Buller's 20 acre selection in Beaconsfield, he has requested me to inform you that he duly arranged with Mr Clayton to have the dividing fence between the two blocks put up; and the contract was let to a Mr John Glismann who has a selection in the neighbourhood. Further Mr Clayton has written him to say that in consequence of Glismann having other contracts on hand for J W Rogers KC and W W Rogers &c., he has not been able to complete the fencing between Mr Buller's and Mr Clayton's blocks. He expects however that it will be completed in a week or two when he will advise the land department of said completion. Mr Buller wishes me to say that aldready there was a log fence between the two blocks but that it was burnt down in consequence of a bushfire having caught it. Land-Note 29 May 1885 GEM-D-38: All Saints Grammar School, East St Kilda. 29th May 1885. Corr No 1094/49. To the Secretary of Lands, Melbourne. Sir, Referring to my letter of last week re improvements on my land in Beaconsfield. I now beg to inform you that the necessary improvements have been carried out and were completed on the 22nd inst. I will therefore feel obliged if you will kindly grant permission to have said land purchased by me at the earliest convenience. In consideration of the sum of forty eight stg (£48) received by me from Mr William Henry Goff, I hereby assign and transfer to the said William Henry Goff all my right title and interest in and to all that piece of land allotment 38 Section D Parish of Gembrook extent of said land being nineteen acres three roods and thirtysix perches (19a.3r.36p) and I request that the crown grant of said land may be issued to and in the name of William Henry Goff. Land-Note 29 Aug 1885 GEM-D-38: 82 Williams Road, Windsor, 29th August 1885 To the Secretary of Lands, Melbourne. Sir, Having purchased from Mr Buller a block of land selected by him under the 49th Section of Land Act 1869, said land being situated in the Parish of Gembrook and known as allotment 38 Section D, extent of same 19a.3r.36p. I request that Crown Grant of same be issued to me and in my name on payment of the regular fees laid down by you. Death-Notice* 29 May 1906 GOFF. - On the 28th May, at "Harpfields," Upper Beaconsfield, William H. Goff, aged 63. GOFF. - The friends of the late Mr WILLIAM H GOFF are respectfully invited to follow his remains to the place of interment, St Kilda Cemetery. William Henry Goff was born in Ireland and educated at Trinity College, Dublin. He was a brilliant scholar, a First Prizeman in Natural Sciences, and Dublin Mathematical Scholar and Exhibitioner. In 1870, All Saints Grammar School was being built in the grounds of All Saints Church in East St. Kilda. When it opened in 1871, Goff then aged 28 became the founding headmaster, a post he held until 1902, when both the school and his health were in decline, and he resigned. Goff was a very early twenty acre selector in the village, his name appearing in the 1877 Rate Books. The following year he built his country home, “Harpfields.” An attractive house, it had a glorious outlook to the Dandenong hills. Sadly, it was a victim of the 1983 Ash Wednesday fires, but was soon rebuilt on the same site by Miss Doris Goff, a grand daughter. In 1883, Goff, was both Honorary Secretary and fund raiser for the Hall Trustees: Halford, Goff, a’Beckett, Elms, and Brind, who had personally guaranteed a loan to allow building to commence. Goff accepted much of the responsibility for the building, organising concerts, persuading local people to become subscribers to the venture, and it seems likely he obtained some money from a Government grant. Initially called the Assembly Hall, it was completed in 1884. 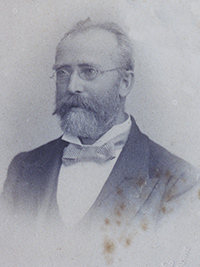 Goff was a Councillor for eleven years, retiring in 1897. He was twice Shire President, and honoured for his work by having a street in Beaconsfield named after him. In 1892, a whimsical Journal reporter writes ““The meetings of the Berwick Shire Council would indeed be monotonous affairs were it not for the presence of Cr. Goff. Being an educated gentlemen, (an Irish gentleman, into the bargain), with a rare fund of humour, he throws upon the most prosaic and dreary subject an interesting aspect, which helps considerably to facilitate the progress of business”. As my term of office as your representative is about to expire, I again offer myself for re-election. Should you be satisfied with the manner in which I performed my duties, will you be good enogh to give me your support at the forthcoming election. Thanking you for past favors, Believe me, Faithfully yours, WILLIAM H. GOFF. Harpfield, Beaconsfield, 28th July, 1888. 12 Oct 1889, A CORRECTION. Sir,—My attention has been called to a notice in your Wednesday's issue of the success of Mr. Arthur Halford, at the Melbourne University. You mention him as a former pupil of Wesley College. Kindly correct this. He was, I am pleased to say, a pupil of All Saints' Grammar School and not Wesley College. 7 Dec 1892, After hammering away for over 12 months, and being roundly abused during the whole of that period Cr. Goff, of Berwick shire, has at last carried a motion for the construction of a road through Mrs Lawes' land, Upper Beaconsfield. 14 Dec 1892, A VISIT TO UPPER BEACONSFIELD. A few years ago a friend and I were discussing the relative merits of several holiday resorts, with a view to spending a fortnight holiday at the most suitable. The Beaconsfield district was at that time becoming popular in this respect, so I suggested that we should sojourn there. "Beaconsfield," exclaimed my friend, disgustedly ; "why, I would'nt go there if you offered to pay all ex's. I've been there before, and, 'once bitten, twice shy.' There are only about three houses there, and a similar crowd of inhabitants. "I remember," my friend continued, "that after our party had been in Upper Beaconsfield for three weeks without seeing other human being, we decided to lay wait for a stray tramp, or whoever passed. A few days after the watch was set we nabbed a 'sky-pilot' riding to a neighbouring parish. We caged him for a few days, to look at ; he threatened us with illegal detention, but as soon as we let him go we got out of the district, and I, for one, never want to visit it again." I listened patiently to my friend's outburst, and, being a new-chum at the time, ergo, gullible I conceived a holy horror of the Beaconsfield country, which did not abate as the years rolled on. However, my time was to come, and, when I received and invitation a fortnight ago from a gentleman residing at Upper Beaconsfield, to visit that locality, the traditions of my new-chumship came to my mind. Finally, I came to the con- clusion that "'twas better to have loved and lost, than never to have loved at all," so I decided to chance the horrors of the expedition, and to take a long and searching look at every human being I saw during the week previous to my visit, in case I should see no others in that Ultima thule of civilisation. My invitation came from Mr. W. H. Goff, principal of All Saints' Gramnmar School, St. Kilda, who is a leading member of the Berwick Shire Council, and has a country residence in Upper Beaconsfield. During the school term Mr. Goff makes frequent visits to Beaconsfield, and it was on one of these visits that I accompanied him. A great many people are not aware that there are two distinct Beaconsfield townships-Upper and Lower, but such is the case, and the first thing that strikes the visitor on an acquaintance with the Upper township after sojourning for a while in the Lower, is the vast difference in the class of people, and the methods of existence. With this explanations I will proceed. Meeting my host at the 4.30 train, we journeyed to Lower Beaconsfield station (there is not a station at Upper Beaconsfield yet, but the energetic inhabitants hope to have one ere long), where a strong, serviceable waggonette was waiting for us. The road to our destination lay in a north-easterley direction, and for about two miles was about as level and smooth as Bourke street. As we proceeded, the road began to ascend, and wound round steep hills innumerable. Splendid views can be obtained from various portions of this mountain road, the high, rugged hills, towering above, and the dim, solemn glens and gullies below, making a beautiful picture in the soft, warm glow of the setting sun. Jim, our driver, was not impressed with the beautiful scenery, familiarity evidently breeding contempt, so he urged his horses to greater effort, and, after about 40 minutes drive, we arrived at our destination. After dinner my host showed me round his orchard, which, for uniformity in laying out, size and excellence of all kinds of fruit—in short, a multum in parvo—cannot be equalled by many orchards of much greatet pretensions. Mr. Goff has a most invaluable manager in James Woolff, whose strawberries, gooseherries and raspberries are the finest in the district, whilst the vitality and superb appearance of the crops of oats, etc., grown under his care are the envy of the adjoining growers. Altogether, Mr. Goff has one of the finest country residences that a man could wish for, with every appliance of civilization as handy as in a town residence. As time was an object with me, I had to make a tour of the district on Sunday, and must confess that my pessimistic views received a severe shock at the sight of the numerous prosperous-looking residences to be seen scattered in all kinds of picturesque localities. There was no sign of the prevailing depression here, and every person we met had a cheerful, well-to-do appearance about him or her, as the case might be. Some really pretty and flourishing orchards, such as those of Messrs. Mackly, Noble, Glissmann and othere, give promise of return- ing fourfold the capital and energy bestowed on them by their proprietors. Another place of interest is the "Big House," an amalgamation of a private boarding house and a genteel hotel. The "Big House" has lately changed hands, and is now under the capable manage- ment of Mr. J. R. Wakeham, a gentleman who has evidently had a deal of experience in that line, and who is rapidly bringing back the good name enjoyed by the establishment years ago. The principal attractions for pleasure seekers in this locality are the wonderfully beautiful fern gullies that exist within half-a-mile of the township. The much-raved-about splendors of Ferntree Gully pale into utter worthlessness beside the glorious abundance and beauty of the ferns to be found in those gullies. One of the ravines goes by the name of "Bain's Gully," owing to the late Mr. Bain, of the Border Hotel, having at one time been the owner of the land. Mr. Bain was passionately fond of' the beautiful spot, and went to a':deal of expense in making a pathway from the top of the hill to the depths of the gully. The land has since been sold, but the proprietor has allowed the place to go to decay, and a neighbor, who evidently objects to picnic parties going down the gully, has maliciously caused a number of'trees to be felled across the path, thus partially obstructing access to the ferns. If a good old English curse could do that neighbor any good, my maledictions on his confounded impertinence ought to make an angel of him. Visitors to Upper Beaconsfield are never allowed to depart without being shown "our Assembly Hall," and well might they be proud of such a cosy, compact and convenient building. To Mr. Goff is largely due the credit of the erection of this handsome edifice, which is an everlasting testimonial of what can be effected by the judicious application of "blarney." The building consists of a large hall (which is used on Sundays for church purposes), a circulating library, with nearly 700 volumes, a commodious supper room, and ladies dressing room, all fitted up with the most modern appliances. In fact, it struck me as being something marvellous that such a small township should possess such a handsome edifice, and when I asked Mr. Goff how it was, he simply "winked the other eye." A courteous and obliging librarian is Mr McLean, who showed me over the building, and supplied me with all necessary information. In conclusion, I cannot well help thinking that a grand future is before this little colony of energetic people. True, most of them are only weekly visitors to the place, but during their short visits a deal of work is planned for their employees, and, not only that, they are mostly men of considerable wealth; who do not begrudge spending a few hundred pounds in improvements. A government fruit expert who recently visited the district gave his opinion that there was not a better place in the colon for growing all kinds of berries, and also several of the larger fruits. In view of this, a number of the leading residents have taken the subject up heartily, and it will not be their fault if, before long, Upper Beaconsfield is not a large exporter of dried fruits of all descriptions. The soil is there, and also the men and capital, so it may be looked upon as one of the '"certainties." Mr. W. H. Goff, late of All Saint's Grammar School, St. Kilda, was taken seriously ill last week, but we are glad to say he is now progressing favorably under the care of Dr. Bennie and a trained nurse. Mrs. Unwin, who is also very ill, is in a very serious condition. There is a greet deal of sickness in the district, and the death of Mr. Little is reported. That "the way of the transgressor is hard," was verified locally last week. A young fellow who has been working here for some weeks past tried to get away without paying his debts. One creditor was seen (much to the amusement of a football team in the railway train who cheered him on), chasing at break-neck speed, whip in hand. He soon overtook the culprit, who was crouching in a hollow tree. Enforcing his remarks with sundry cuts with the whip, the Beaconsfielder made him empty his pockets leaving him a sadder though, it is to be hoped, a wiser man. Soon after this another creditor was noticed galloping furiously on horse back in the same direction overtaking the offender on the Narre Warren hill. After punching him, he saw the futility of trying to get blood out of a stone, and turned disconsolately homewards. The Eumemmerring Hotel has been robbed of some valuables by two swagmen and a woman. Their descriptions are well known to the public, and it is thought they will soon be captured. Dozens of suspicious looking characters are camped along the creek. Corner of Hanover and Frederick Streets, WINDSOR. Guaranteed Farm-fed Bacon and Ham. Genuine Pork Sausages. Corned Beef and Ox Tongues. Small Goods of every description made on the premises. FREE FROM PRESERVATIVES of any kind. [S61] Upper Beaconsfield History Archive ,"photocopied pages, not sure of source - probably history of All Saints' Grammar - A4 publication, typed." [S50] Miscellaneous Source, "Ireland Marriages, 1864-1870," database, FamilySearch (http://familysearch.org/). Indexing Project (Batch) Number M70238-6 / System Origin Ireland-EASy / Source Film Number 101518 / Reference Number p 653. [S36] Inward & outward passenger lists to and from Victoria. Series: VPRS 14; 7666; 7667; 7786); PROV (Public Records Office Victoria), TRUE BRITON. B300/006. [S185] Property Titles. ; PROV (Public Records Office Victoria), C/T 1120-983 - William Henry Goff of Windsor. [S81] Land Records, Parish Maps & Council Rate Books. ; PROV (Public Records Office Victoria), Land File 631/49. [S185] Property Titles. ; PROV (Public Records Office Victoria), C/T 1120-983 - William Henry Goff to The Victoria Mutual Building and Investment Society. [S34] PROV (Public Records Office Victoria), VPRS 267/ P7 unit 538, item 1882/3042. [S185] Property Titles. ; PROV (Public Records Office Victoria), C/T 1127-271 - Albion Theophilous Walkley to William Henry Goff of Williams Road Windsor Schoolmaster - C/T 1523-443. [S34] PROV (Public Records Office Victoria), VPRS 267/ P7 unit 569, item 1884/820. [S81] Land Records, Parish Maps & Council Rate Books. ; PROV (Public Records Office Victoria), 1094/49. [S81] Land Records, Parish Maps & Council Rate Books. ; PROV (Public Records Office Victoria), Land File 1306/49.4 George Edward Clayton requests that the crown grant to GEM-D-39 be issued to William Henry Goff. [S185] Property Titles. ; PROV (Public Records Office Victoria), C/T 1750-966 - William Henry Goff of Windsor. [S81] Land Records, Parish Maps & Council Rate Books. ; PROV (Public Records Office Victoria), Buller requests that in consideration of £48 received by him from Mr William Henry Goff the title to GEM-D-38 be issued to William Henry Goff. [S185] Property Titles. ; PROV (Public Records Office Victoria), C/T 1750-965 - William Henry Goff of Windsor. 1306/49. WILLIAM HENRY GOFF. GEMBROOK 39A D. 3--0--12. 1877 - 1888. [S185] Property Titles. ; PROV (Public Records Office Victoria), C/T 2002-376 - William Henry Goff of Windsor. [S185] Property Titles. ; PROV (Public Records Office Victoria), C/T 1496-040 - William Henry Goff of Williams Road Prahran Gentleman. [S185] Property Titles. ; PROV (Public Records Office Victoria), C/T 1120-983 - William Henry Goff to Agar Wynne and Robert Joseph Patrick Gibney. [S34] PROV (Public Records Office Victoria), VPRS 267/ P7 unit 643, item 1902/413. [S34] PROV (Public Records Office Victoria), VPRS 14524/P1/6 Bailiff's Warrant Books Action No 413. [S185] Property Titles. ; PROV (Public Records Office Victoria), C/T 1523-443 lists FiFa against GEM-D-40 / C/T 2002-376 against GEM-D-39A / C/T 1750-966 against GEM-D-39 - C/T 1496-040 against GEM-D-35.36.37. [S185] Property Titles. ; PROV (Public Records Office Victoria), C/T 1496-040 - Mary Vale of Westbury Street St Kilda Married Woman. [S185] Property Titles. ; PROV (Public Records Office Victoria), C/T 1120-983 - William Henry Goff to Alexander Sanderson Robertson - Robertson transferred the mortgage back to William Henry Goff, probably because Agar Wynne and Robert Joseph Patrick Gibney took possession at some stage. [S185] Property Titles. ; PROV (Public Records Office Victoria), C/T 1523-443 - Mortgage to The English Scottish and Australian Bank Limited - was not discharged, but bought back by the Goff family. [S185] Property Titles. ; PROV (Public Records Office Victoria), C/T 2002-376 - William Henry Goff to English Scottish + Australian Bank Limited. [S185] Property Titles. ; PROV (Public Records Office Victoria), C/T 1750-965 and 966 - William Henry Goff to English Scottish and Australian Bank Limited. [S11] Newspaper - Argus 29 May 1906 p1. [S185] Property Titles. ; PROV (Public Records Office Victoria), C/T 1120-983 - Agar Wynne and Robert Joseph Patrick Gibney took possession at some stage. [S35] Probate Records, PROV (Public Records Office Victoria), VPRS 28/P0, unit 1416; VPRS 28/P2, unit 864; VPRS 7591/P2, unit 427. [S14] Newspaper - Village Bell: 167-2007 p8. [S11] Newspaper - Argus 9 Apr 1873 p8. [S11] Newspaper - Argus 6 Jan 1880 p3. [S12] Newspaper - South Bourke and Mornington Journal 7 Dec 1892, p2. [S12] Newspaper - South Bourke and Mornington Journal 14 Feb 1892, p2. [S11] Newspaper - Argus 11 Aug 1894 p8. [S12] Newspaper - South Bourke and Mornington Journal 25 Aug 1897, p2. [S11] Newspaper - Argus 7 Jan 1903, p5. [S11] Newspaper - Argus 3 Feb 1903, p10. [S12] Newspaper - South Bourke and Mornington Journal 29 Jul 1903, p2. [S12] Newspaper - South Bourke and Mornington Journal 2 Sep 1903, p2. [S11] Newspaper - Argus 16 Jan 1904, p9. [S11] Newspaper - Argus 14 Jul 1904, p10. [S11] Newspaper - Argus 21 Jul 1904, p3. [S12] Newspaper - South Bourke and Mornington Journal 30 May 1906, p3.